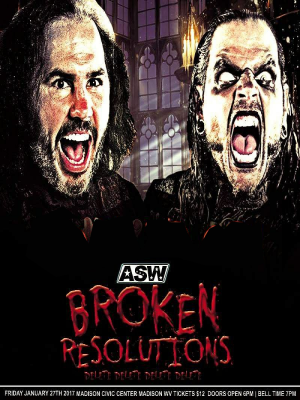 Tonight at 7 PM at the Madison Civic Center (261 Washington Ave, Madison, WV) ASW Wrestling presents Broken Resolutions, an epic wrestling card featuring TNA Wrestling stars “Broken” Matt and Jeff Hardy, whose match will be recorded for an upcoming episode of TNA Impact on Pop TV. Since that time the Brothers Hardy have refined the act and have been one of the most interesting sideshow acts that pro wrestling has to offer. At this point, tickets, which are almost sold out, will only be available at the door. 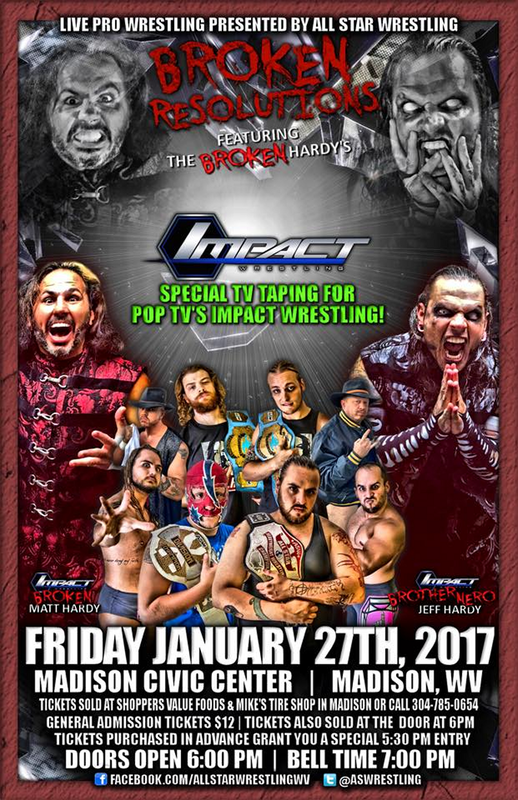 In addition to the Broken Hardys, the card will feature ASW’s usual top-notch wrestling stars putting on a whole evening of thrilling action. It’s easy to write posts and articles that tear apart local television newscasts. By the sheer nature of the business, they have to make a lot of sacrifices in order to keep their operations profitable. People more qualified than I have laid out, point by point, the many deficiencies that you find with local TV news. I’m not going to do that today. Instead, I’m going to offer some praise, and some constructive criticism to a feature on one local newscast. 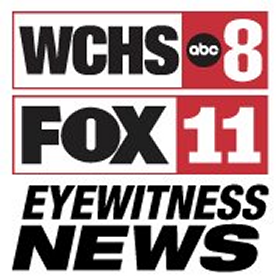 WCHS TV/Fox 11’s Eyewitness News started a new feature on their morning news programs a few months ago called “Traffic Tracker” (I believe they used the name before the recent change, but it’s an all-new approach). With Traffic Tracker, a reporter, usually Nick Patrick, drives around with a dashboard camera on his car, showing how traffic is flowing in Charleston and the surrounding areas. If need be, they’ll drive to the scene of an accident or traffic tie-up and show live coverage of the affect it has on your morning drive. Most days the anchors cut to a report from Traffic Tracker every ten minutes, in conjunction with the weather. Now, this is not a neccessary feature of the news, but it is well-done and adds extra information to the mix. It’s helpful to the audience and makes for more compelling television than simply showing a shot from a DOH webcam while reading a traffic report. As someone who is not a huge fan of many of the conventions of morning news programs, Traffic Tracker is a welcome addition to the established format. The only thing about Traffic Tracker that I find alarming is that the reporter is driving his or her self around while reporting. When the feature first began, I assumed that the reporter was a passenger, but after a few weeks they added a second camera, shown as an inset on screen, that confirmed that our Traffic Tracker was flying solo. 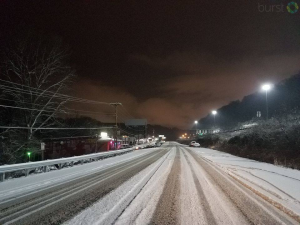 Nick Patrick does a great job with this, but I worry about how much of a distraction it is to read the traffic report and stay in contact with the station and then actually report while driving. I realize that the station probably cannot afford to send another crew member out to do the driving, but it just seems a bit risky for one guy to be doing it all while he’s behind the wheel. I seem to remember WCHS having a high-profile public service campaign a year or three ago where they reminded people that it’s illegal to text or talk on a phone while driving. I’m pretty sure that applies to surfing the net or checking social media as well. While I really enjoy the service provided by WCHS TV’s Traffic Tracker, I hope that maybe they can get a sponsor that would justify the addition of a driver to the crew. I’d feel better watching it if I weren’t afraid that we might see a dangerous incident on live TV. To be fair, I noticed that they did have a driver during the recent snow situation. I hope they continue to do that in snowy weather, but they have had their reporters driving themselves in the rain, and that is a little scary at times. So far Patrick and Starkey have not had any close calls while driving (that I’ve seen), but it seems like the station is pushing its luck a bit, and I’d like to see this useful and practical feature of the news continue with a bit more of a safety net. After a two-week bout with the flu that has been running roughshod over everyone at Haversham Recording Institute in London, Sydney Fileen is back with a brand-new episode of Sydney’s Big Electric Cat on The AIR. 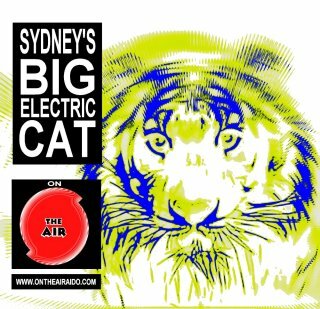 Sydney’s Big Electric Cat can be heard Friday at 3 PM, with replays Saturday at 2 PM, Sunday at 7 PM, Tuesday at 8 PM and Thursday at 1 PM. Soon the Big Electric Cat will have a regular overnight marathon on The AIR. Listeners of The AIR on Friday will also be treated to a new episodes of The Hitchhiker’s Guide To The Galaxy at 8 PM, and The Third Shift at 9:30 PM (also replayed Saturday at 8:30 PM). Fans of the unexpected and slightly profane should tune in to The AIR Saturday night at 7 P for a show that we can’t get away with mentioning by name here. Rest assured that the mildy-obscene name is 100% accurate. That’s it for this week’s PopCulteer. Check back for our regular features and special pre-Toy Fair updates in the coming days.